Learn German nouns with effective exercises. You learn words from common situations and expand your vocabulary with other common nouns. 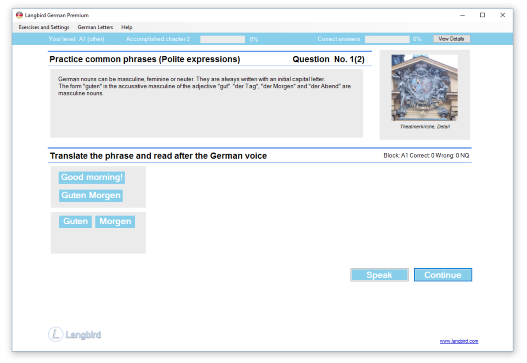 Effective German exercises where you can practice thousands of German nouns, their gender and plurals. Master the details of German. Learn the nouns you need to know to speak fluently. Practice the rules determining gender of German nouns, the plurals, compound nouns, feminine and masculine forms and much more. The plural article is "die"